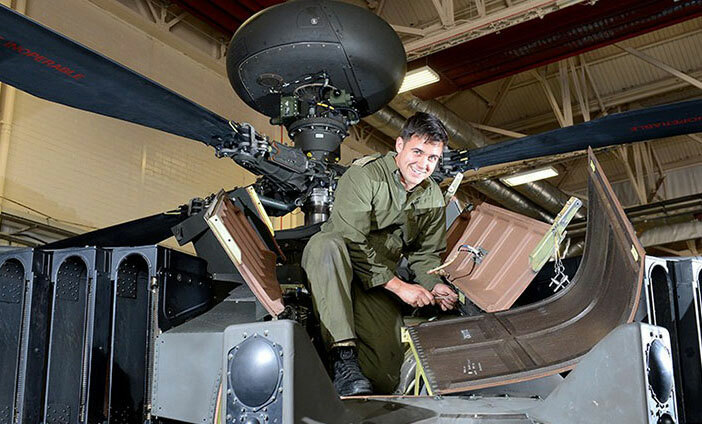 Aircraft Technicians are responsible for the repair and maintenance of all Army aircraft, from Apache Helicopters to unmanned aerial vehicles. They work on all mechanical systems including the airframe, engines and control systems. You will be exceptionally well trained, completing first a basic, then advanced apprenticeship. A degree in Engineering is obtainable later in your career as well as membership of professional institutions. Aircraft Technicians have a high level of responsibility and are promoted rapidly to reflect it. You will travel the world supporting our aircraft wherever they go. Take responsibility for flight safety. Work under supervision until you’ve gained enough experience to take control. Be posted wherever the British Army has aircraft. Then it’s off to the Defence School of Electronic and Mechanical Engineering at MoD Lyneham to start your technical training. Over the next 66 weeks, you learn how to fix aircraft including some electrical, hydraulic, gearbox and gas turbine systems. You will also be taught to drive and gain your licences in Car and HGV. When your Initial training is finished, and you join your unit, your pay will rise to £18,859. You still use your trade skills and with help from your Lance Corporal, you keep your section trained and ready for action.